I am still writing frantically, taking advantage of this window in my cancer treatment before I get too tired to write. 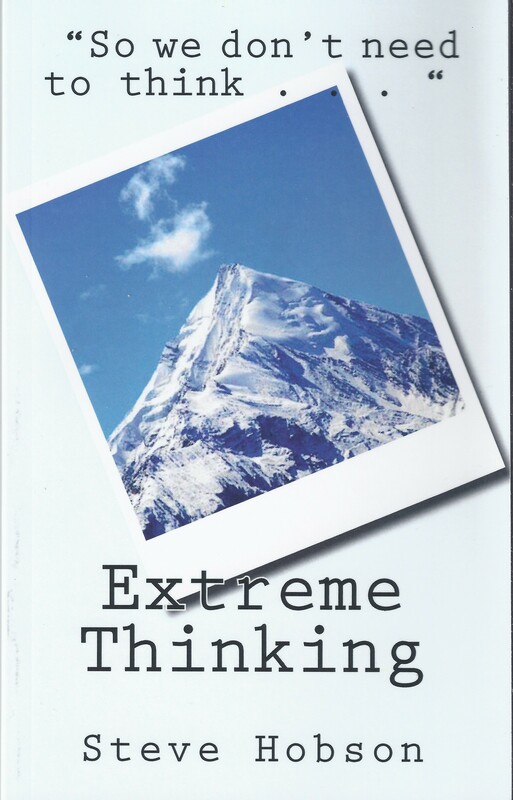 This is my first book of 2018, called Extreme Thinking. It is my first foray into humour, so I am nervous that my sense of humour might be too obscure. I hope not! Extreme Thinking is a part of the English tradition of light-hearted parodies that includes Three Men in a Boat by Jerome K Jerome, The Ascent of Rum Doodle by W E Bowman, and I An Actor by Nicholas Craig. Welcome aboard for this light-hearted trip around the relatively unknown activity of extreme thinking. Thinking as a sport has been known variously as meditation, mindfulness or Philosophy. Extreme Thinking, however, involves thinking where no thoughts have been before. It is high altitude thought, and not for the faint-hearted. Steve compares it to Himalayan climbing. He describes the various elements of the sport. Here you will find the madness and wisdom of millennia, and scattered warm-up exercises from Japanese haiku, Zen koan, the Bible, riddles and jokes and television football commentary. If you make it alive to the end, you will have some glimmering of understanding of the words of the extreme thinker, Robert Descartes, who quipped, “I think, therefore everything is”. As usual, it is available from Amazon, price £4.50, 104. This entry was posted in Books, buddhism, Philosophy, Sport and tagged books, buddhism, climbing, expeditions, humour, Philosophy, thinking, walking. Bookmark the permalink.